Call Up The Reserves - It was 1968 and President Johnson approved a limited call up of Reserve Military units 24 months or less. It included 25,000 men from all branches. Many or most of the Army units were not combat ready and only a few about 5,000 were sent to Vietnam. One of them, the 231st Transportation Company from St. Petersburg, FL was called in Ready or not we were chosen to get battle ready in 4 months and report to Duty. 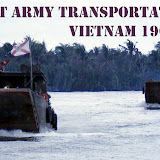 Little did we know if would be Vietnam Mekong Delta as a logistic Boat Unit. The 231st was staffed by 182 men of worldly experience from 19 to 50 years of age. Combat was not our gig but in the Army’s profound judgment, they figured out a special mission for our Boat Crews. We were to support all the combat troops in the Mekong Delta with material of all sorts including carrying Troops to battleground, Landing Mat, Ammo, Beer, Toilet Paper etc. The War was on for the Fighting 231st. This Reserve call-up was known as the,Clifford Experence, Clifford had replaced Robert McNamara as Secretary of Defense in 1968 and convinced President Johnson to deny General Westmoreland’s request for an additional 206,000 American troops. So the training began and the main body arrived in late Aug. 1968 in Vung Tau South Vietnam to addapt the LCM's (boats). Plywood Quarters were built for 6 men to a boat, two 50 caliber machine guns and two 30 caliber machine guns plus grenade launchers and personal small arms were installed. Six man crews ( NCO’s) manned the boats and the mission began with a bang. Something like 74 pallets of Budweiser to the 9th Infantry deep in the Delta at Dong Tam. We were instant heroes! - Changed Date from (1965-1971) on Tag. This tag is really cool and says it all. All troops that served in the Brown Water Navy should have one of these. Pass The word. Cameron Design (copyrights pending) Mekong Delta Yacht Club License Tags for your ride. A discrete way of all Delta Vietnam Vets saying, "I was there". $15.00 each, Plus $5.00 if mailed. Send orders via e-mail to TJTwitty@Gmail.com and pay for them using PayPal link below. Note the company receiving donations is LovedOnes Inc.
LovedOnes has handled all cost to publish CombatVets and 231st Vietnam Websites. T Shirts for 231st Army Reserves. Norm Cameron has designed some really great cool looking T's and is collecting orders at this time. Go to this page to inspect and order your shirts. These shirts are Limited Edition one time print and only available to members of the Army 231st Reserves Members and their families. This includes all 231st members that served at any time and any place. See Larger Images and order form here.. Order blank is obsolete..
Post 273 Madeira Bch. Click Photo or link below for photos. Link To View Here or See Movies below. Dr. Boyd and other VIPs did a fantastic job presenting the 50th Commemoration event at the Max Stover Army Reserve Center. He presented a Certificate of Appreciation to all attending 231st Army Reserves Boat Unit Members. I have sent out a high resolution to all members that we have e-mail for and it may be printed for framing. It was a well done presentation and 15 of our 231st Vietnam Vets present and some with family plus 2 from the 319 Truck Unit out of Augusta GA. The current St. Pete 788th Medical hospital reserve unit was present plus a covey of Army Brass. Our hands were sore from all the Welcome Home Handshakes. Where were all those nurses when we were over in Nam? It was well done and accepted by attending Vets and Family. Very Respectfully, JOHN "JAY" BOYD, Ph.D.
Click Here for photos. The Reserve Unit in Tampa picked us up in a LCM (Mike Boat) ride in Tampa Bay. Was an upgrade to the boats we served on in Vietnam. Changes in power from 4 671 GMC Diesels to 2-V12 GMC Diesels. Much less weight and more power. What we did. Friday, Oct. 13th: 2006 Arrival reception around Harry’s Pool Bar at Sirata Resort. About 31 of the vets showed up for cocktails and then it was off to Silas Dents for Dinner and more drinks. The night ended up at Sirata Lobby Lounge whereas about 8 of the seasoned Vets closed the place down, or almost. .
Saturday, Oct. 14th: 10:00 AM started with a hang-over for some and we spent the day telling lies and showing the DVD's and slides. Notable DVD' included the Super 8 movies converted by Jim Sanders and Tracy Presser which we were able to project for all to see. (These images will be available shortly vis this website) 6:00 PM – 10:00 PM we boarded the Starlight Princess for our dinner cruise with speaker George Calder Supervisor of the Florida Dept. of Veterans Affairs at Bay Pines. Interested facts and pointer were obtained for the benefits of both Vets and Spouses for now and into the future. Lt. Joe Vetrano read the list of our departed comrades in arms and we toasted them in spirit. An outstanding dinner was served and we visited and listened to the band and did some dancing. Everyone split at 10:00 PM when the boat landed to watch the Gators have a melt down. It was a great night and the weather was perfect. Sunday, Oct. 15th: Breakfast at Resort Restaurant. for those that were up and at them. Goodbye's by all and a promise to get together in a year at Chat A Ways for lunch and plan a Caribbean Cruise for the 40th Anniversary of our Call Up. So put it on your calendar now Oct 2008. George Calder gave me his direct e-mail to his Bay Pines office and is standing by to help with any claims you may want to submit for Service Connected Disability. Reunion 2004 and what we did. Movie on YouTube Published from Lowell Thomas movie collection. Interesting new images of the mission. Click on Lowell's Photo. ENJOY! (If no music, it's been blocked, -but we have disputed the copyright claim) . Thanks Rod Harris for providing Lowell's Movie. RIP Lowell Thomas on of the great guys. Visit www.CombatVets.net and publish your bio.